In 1770, Princess Marie-Antoinette of the House of Hapsburg, youngest daughter of Empress Maria Theresa of Austria, marries at the age of fourteen, Prince Louis (future Louis XVI) of the House of Bourbon, eldest grandson of King Louis XV of France. In anxiety over some childishness still lingering in Marie-Antoinette, Empress Maria Theresa sends over to France her confidant, Count of Mercy-Argenteau, on the mission to tutor Marie-Antoinette to grow up to be a beloved queen of the French people. Marie-Antoinette fascinates the French court with her beauty and loveliness in only a short time. However, just as Empress Maria Theresa feared, she is too tender and indiscreet to perceive the shrewdness of the courtiers trying to gain her favor for their own interest. In addition, as she has a weakness for merriment and luxury, her free spending further helps to empty the kingdom's coffers already almost exhausted during the late king's days. The ever-rising taxes bear harder upon the people, who attribute the cause of their hardship to Marie-Antoinette and start vehemently hating her. Marie-Antoinette is feeling lonely and suffocated within the sumptuous but very formal court in Versailles. Her husband, Louis XVI, prefers hunting and devising locks to spending time with her. She finds consolation in Hans Axel von Fersen, a young Swedish Count studying in Paris. He is handsome, intelligent and gallant. They naturally fall in love with each other and begin to secretly meet. It is a matter of course that their relationship will eventually result in finding the queen in a difficult situation. The rumor about the queen's adultery with Fersen increases the people's hatred for her and goes far toward instigating the people to start riots in various parts of France. Oscar, female captain of the royal guards in charge of the queen, keeps friends with Bernard, a revolutionary journalist and Rosalie, his wife. Although Oscar is a noble, Bernard and Rosalie are commoners. Oscar has too much a sense of justice and sincerity not to lament with them over the decadence of the court and nobles. Oscar dares to make the suggestion to Marie-Antoinette that she should send Fersen back to Sweden in order to wipe out the malicious rumor about them spreading in the court. Marie-Antoinette ardently speaks out of her love for Fersen and declares that she will not separate from him even if she falls damnable. Then, Oscar urges Fersen to go home now that his relationship with the queen has come to the knowledge of the king. However, Oscar fails in persuading him. Nothing seems able to separate them. Exasperated, Count of Mercy-Argenteaucalls on Fersen at his residence and pleads with him that if he really loves her, he should leave for Sweden for the sake of her dignity as queen which may otherwise be exposed to danger. Fersen realizes he is in a difficult predicament, and heartbreakingly makes up his mind to go back to Sweden. Oscar hears Fersen's decision with mixed feelings because she is privately in love with him. Only Andre who has secretly been in love with her for a long time is aware of her sentiment. Andre asks Fersen to speak kindly to Oscar before going back home. However, Fersen replies that it is Andre's role to take care of Oscar. Hearing that Fersen has left for Sweden, Louis XVI sympathizes with the queen's grief. Marie-Antoinette, moved by the king's thoughtfulness and magnanimity, awakes at last to her queenship. The confrontation between the aristocrats and the Third Estate is intensifying at the Estates General. Bastille Day is drawing near. Oscar applies for the transfer to the post of captain of the French Guards (later absorbed by the National Guards) in Paris with the determination to serve the nation. Those close to Oscar dissuade her in vain. On the night before going to Paris, she repays Andre's love by accepting him. On July the 14th in 1789, in front of the Bastille, Oscar decides to fight against the royal army, joining her troop with the Parisian rioters, and, in the course of fighting, both Oscar and AndreÂ´ are shot dead. In Sweden, remote from the French upheavals, Colonel Girodelle who served under Oscar visits incognito Fersen. He tells him that Oscar and Andre were killed and that the king and his family are now in danger. 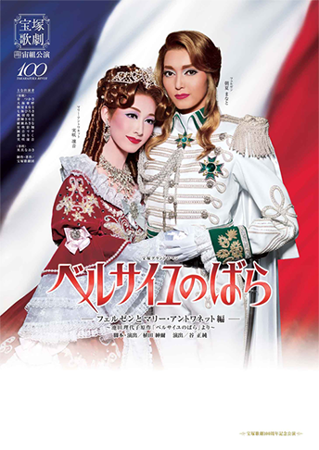 Alarmed, Fersen resolves to return to France with Girodelle to rescue the French Royal Family. However, it is difficult for Fersen to go outside the country since he is under close surveillance of the Swedish government. He hits upon a plan to evade the vigilance by making profit of the festive stir on the king's birthday. During the birthday banquet, Fersen confides to King Gustavus III his love for Marie-Antoinette and his determination to deliver her and her family. Then, he breaks through the soldiers trying to stop him and sets forth towards France in a hurry. The National Guards reinforced after the fall of the Bastille march towards the Palace of Versailles. Marie-Antoinette declares that she will go to Paris to assume the responsibilities as Queen of France while the Count of Provence proposes to mobilize the royal army. Created by daimon_sakura. Last Modification: Monday 25 of February, 2019 07:11:10 PST by caithion.